One night my husband and I were getting off work and this cat just came right up to us. Adopting Snowflake was the best decision we have made in a long time. She is the most beautiful, loving cat I have ever owned. She is full of personality! It was really nice to hear about and see a picture of your lovely Snowflake. 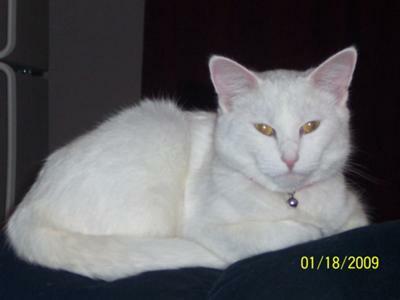 When I adopted my white cat Star the shelter said she was called Snowflake -- but she wouldn't answer to that name. When I tried "Star", she seemed to like it. So she became Star. We wish you many happy years together. Snowflake is a gorgeous kitty. Thanks for sharing her picture.